Alexis Piquer has worked for Lupicinio International Law Firm and Eversheds representing financial clients like Bankia, La Caixa or Banesto in mortgage and bankruptcy operations. Advising clients in financial operations and assisting with contracts and commercials agreements. He is mainly entrusted with complex proceedings dealing with civil law issues, commercial matters, insurance and banking-financial services cases (with a specific focus on forex matters). Likewise, Alexis has worked for international clients and helping them in international matters. He speaks Spanish, Italian and English. He graduated in Law from the University of Barcelona. He is mediator in Centro de Estudios Jurídicos y Mercantiles (Madrid) and Juris Doctor in the EEUU. 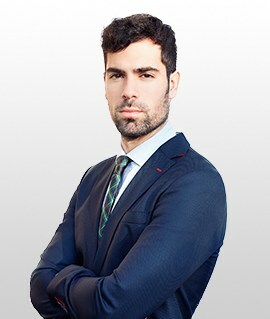 He is member of the Barcelona Bar Association and member of the Catalan-American Bar Association. He is of Counsel.